Renfrewshire Family History Society was founded in March 1999 and has Charitable status. It exists to promote the study of Family History, based on the County of Renfrewshire encompassing Abbey Parish, Cathcart, Eaglesham, ErskineEastwood, Greenock, Houston & Killellan, Inchinnan, Inverkip, Kilbarchan, Kilmacolm, Lochwinnoch, Mearns, Neilston, Paisley, Port Glasgow and Renfrew. The Society holds regular Meetings throughout the year covering topics of interest to family historians. Due to the refurbishment of Paisley Museum, Meetings will now be held at UNIVERSITY of the WEST of SCOTLAND, Room L 208 (Elles Building East) and are usually held on 3rd Thursday of the month (except December) at 7.15pm (Doors Open 7.00 pm). We welcome all to our meetings. A PDF copy of this book may be viewed here. We are now in Paisley Abbey, Cathcart Aisle on Tuesdays & Thursdays from 10am – 11.45am. Both days are manned by RFHS volunteers who will help anyone in their search for family. 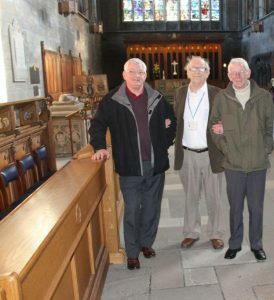 Our volunteers at our ‘home’ in the Abbey – are a welcoming bunch! Membership is available to anyone with an interest in family history in, or relating to Renfrewshire, on payment of the annual subscription. Membership entitlements will include Society newsletters and guidance with Family History Research. The Society publishes a Journal twice in the year, which is issued to its members without charge. Articles of interest are published as well as records of meetings. Contributions and ideas are always welcome. Select Journal 11 to view a sample of one of our Journals.